We have a gnome fighter and a dragonborn bard in our campaign. The gnome sometimes gets in a makeshift sling on the dragonborn's back to shoot arrows at enemies during combat. Thus far I've considered the dragonborn an independent mount when opportunity attacks (OAs) arise, and have also granted the gnome cover as applicable. ... if the mount provokes an opportunity attack while you’re on it, the attacker can target you or the mount. In this case neither the dragonborn nor the gnome can provoke an opportunity attack because they are not moving using their movement, action, or reaction. Only the horse can provoke an opportunity attack. If the attacker cannot attack the gnome in this case, then the gnome is completely safe from OAs. If the horse provokes an opportunity attack can the attacker decide between the dragonborn, the horse, and the gnome? Note up-front that allowing PC to ride another PC is already up to DM discretion as to whether the PC (the dragonborn in the case) has the "appropriate anatomy" to be a mount. Playing around with this can allow fun things like your gnome/dragonborn duo but also things like centaur stacks. The rules also clearly are not written to handle mounted stacks. But I will give you first a purely rules-based ruling and then what I consider to be a more reasonable ruling. First, I will clear up a confusion about the rules that greatly affects the discussion. if the mount provokes an opportunity attack while you’re on it, the attacker can target you or the mount. if the mount provokes an opportunity attack while you’re on it, you also provoke an opportunity attack. You can see a direct impact of this ruling here. The rules create a hierarchy in which a mount has a rider. The rider of the mount can be targeted by opportunity attacks that the mount provokes. However it is not clear whether the gnome would be considered a rider of the horse as well as of the dragonborn or just a rider of the dragonborn. Thus the RAW has two possible interpretations. As a DM, you have to decide how you want to rule it. I will discuss both and outline how they work out. This has a bit of very specific support in that it seems that you are considered a rider of a mount if you are "on it". While that is not defined, it is hard to argue that the gnome is not "on" the horse even though they are not directly riding on the saddle. If you rule this way, then the gnome is a valid target if either the dragonborn or the horse provokes an OA. However, this ruling is messy and doesn't make a ton of sense intuitively. 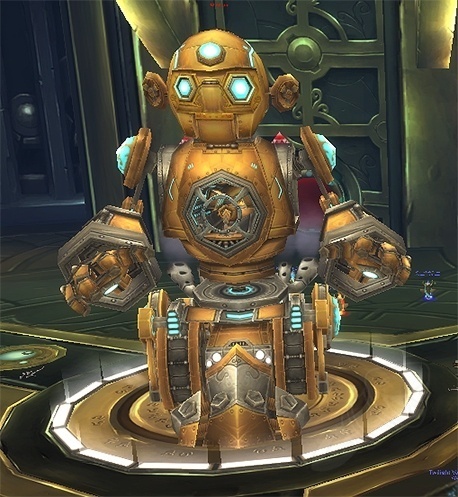 It also means you have to deal with the fact that the gnome is mounted on two things and any rules that affect mounts or their riders could create complicated interactions. In this interpretation, the gnome is considered to be a rider only of the dragonborn and the gnome is not affected by anything that affects the riders of the horse (but not the riders of the dragonborn). In this case, the gnome is a not a valid target if the horse provokes. The gnome gains no benefit to being mounted on the dragonborn while also being mounted on the horse. All this does is add needless convolution and confusion for no added benefit for anyone. As a DM, a very reasonable ruling that simplifies matters for you is to just consider them both as mounted on the horse while the dragonborn is mounted. That means that (like RAW option #1) the gnome would also be a valid target for OAs that the horse provokes. This makes sense from a narrative perspective and simplifies the rules because you avoid the ambiguities that mount stacking has entirely. As soon as the dragonborn dismounts simply consider the gnome mounted to the dragonborn again. Of course, being able to be targeted by an attack is still limited by the reach of the attack. It might be worth noting that depending on how and if you track the vertical height of this mounted stack, the gnome might be out of reach for most attacks with a range of 5 feet. Multiple creatures riding each other is not covered in the rules, so a GM will have to make their own ruling if allowing this. The rules don't account for Matryoshka-style mounting, so of course the rules break down when it is allowed. Looking at the spirit of the rules, it seems the intent is that rider(s) should be targettable by OA triggered by their mount(s). I would allow the enemy to attack any of the 3 targets. Long story short, if a GM is allowing this, you should also look to them for the OA rules associated. The horse and Dragonborn can both be hit. The Dragonborn, while on the horse, is using their own movement to control the horse--this is not a wild horse which has its own turn in combat and is making its own decisions about how and where to move using its own movement, the Dragonborn's movement got delegated to the horse they're riding. So the Dragonborn + horse set should be treated like a mounted pair as per the rule on p. 198. The gnome + Dragonborn set, however, falls under the general rule on p. 195, as the gnome is not controlling their own movement (or delegating it). The gnome's movement is entirely at the control of the Dragonborn; they might have input or suggestions, but ultimately they're being carried and have no control over their own movement. So, while the Dragonborn is dismounted, they would be provoking (and taking) the OA, while the gnome would not. Together, in this case, that means that the mounted-Dragonborn-carrying-a-gnome situation here means horse + DB can be targeted due to moving of their own volition, gnome cannot be. If the gnome were to jump out of the sling to get further away while the horse + DB were still in melee, and didn't Disengage first, then the gnome could be targeted for an OA . Not the answer you're looking for? Browse other questions tagged dnd-5e combat opportunity-attack mount targeting or ask your own question. If one PC uses Bigby's Hand to carry another character through a cluster of enemies, does that movement provoke attacks of opportunity?